At least on our first trip somewhere, we bird with a guide. And the best guides we've found are at Tropical Birding. Uniformly knowledgeable, hardworking and friendly. And Tropical Birding does an immense amount of volunteer work at High island each spring. We've used Tropical Birding on five trips and been completely satisfied with their work each time. Even with a guide, you still need to know a bit about the birding destinations you will be visitng, the species you can expect and the amenities at each area. There's not a decent guide to the whole state of Texas, but the Texas Coastal Bird Guide is pretty good. You'll also need a guide to identify the birds you see. Sure, the guide will tell you, but if you want to make it stick in your head, you'll want to study a photo. 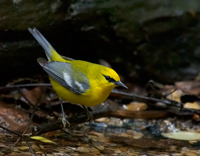 We like National Geographic Bird of North America. Sibley is an excellent second choice. The lodgings in High Island, Texas, are pretty limited. Winnie, about 20 minutes away, is probably a better bet. It's at the Highway 124 exit south off of Interstate 10, east of Houston. There are several national franchise hotels. We stayed at the Holiday Inn Express, which was fine. Be sure to have a supper at Papa's Place. I photograph birds with an Olympus E-5 digital single lens reflex camera, a Zuiko 300mm f2.8 lens, usually with a 1.4 or 2.0 teleconverter. I use a Gitzo 2542L tripod for almost all shots, with a Really Right Stuff ball head.